Oh boy, the saga surrounding Rebecca Budig&apos;s return to All My Children is getting even more interesting. 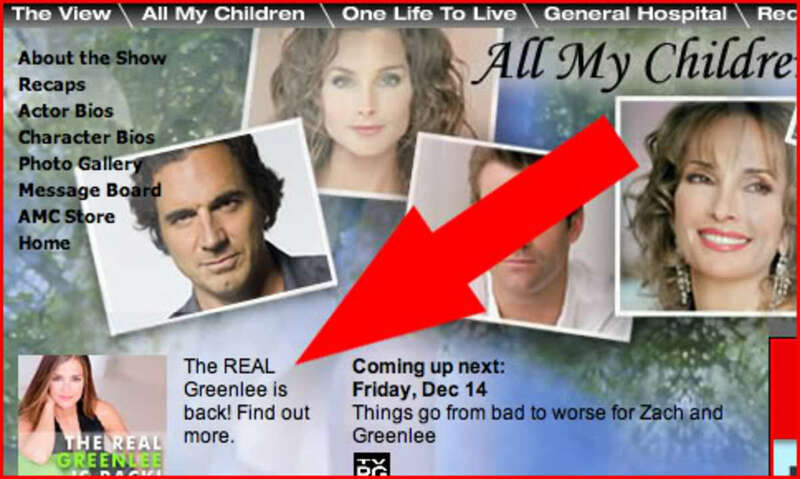 Two days after word broke of Budig&apos;s return ABC is rolling out a PR campaign to pull viewers back in, going so far as to put "The REAL Greenlee is back!" on their website. "Certain actors put such an indelible mark on their roles that it&apos;s really difficult for anyone else to fill in for them. You&apos;re the REAL Greenlee. Aw, you&apos;re so sweet! You make me feel so good because I have this mixed bag of emotions going on right now. Because I love Greenlee, I feel protective of her! [Laughs] In one way, I feel really excited to go back and see what happens with her. In another way, I have a house, a husband, a dog and a life in L.A. But change is really good�. It creates movement. I&apos;m excited. What convinced you that now&apos;s the time to come back as Greenlee? It just sort of worked out, the timing and everything. My life is in L.A. right now, and there&apos;s a lot of things that they did to make this easier for me. [ABC Daytime president] Brian Frons knows how to make things look really good!" Now don&apos;t get me wrong, I&apos;m glad Budig is coming back but its not often that a show or network has the balls to use "The Real" in describing a return of a star while another actress is still on screen. "The Real" Controversy: What Is The Impact?